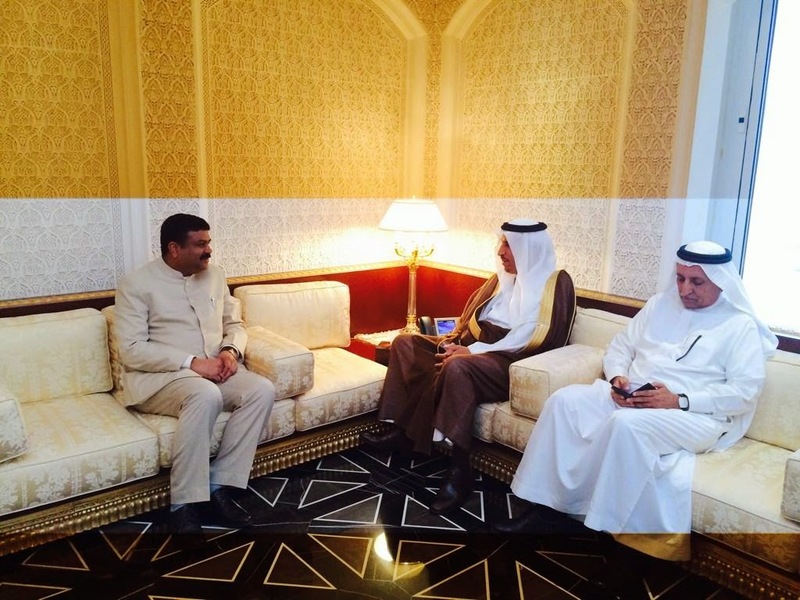 The Minister of State (Independent Charge) for Petroleum and Natural Gas Government of India, Shri Dharmendra Pradhan, held bilateral energy consultations on Tuesday (28.10.2014) with HRH Prince Abdul Aziz Bin Salman Bin Abdulaziz, Assistant Minister for Petroleum and Mineral Resources, Kingdom of Saudi Arabia in Riyadh on matters of mutual cooperation in oil and gas sectors. Sh. Pradhan led the Indian delegation comprising senior government officials and Chairmen of IOCL, HPCL and GAIL. Prince Abdul Aziz Bin Salman Bin Abdulaziz led the Saudi delegation during the delegation level talks under the second round of Ministerial level Saudi Arabia India Energy Consultations. Sh. Dharmendra Pradhan called on H.E. Engr. Ali bin Ibrahim Al-Niami, Minister for Petroleum and Mineral Resources and held discussions on wide ranging issues related to cooperation in the hydrocarbon sector between the two friendly countries. During the delegation level consultations, both sides discussed the world, Asian and Indian oil markets, India’s additional requirement for crude oil and LPG, investment opportunities, cooperation in research & development, and related global issues pertaining to G20, International Energy Forum (IEF) and JODI. The two sides also discussed areas of cooperation in Saudi Arabian and Indian energy efficiency policies and programmes. The Indian side conveyed India’s growing requirement for crude in future due to growing Indian economy, increase in refining capacity and rapid changes being brought by the new government aspiring for double digit growth in foreseeable future. Both sides also discussed specific issues concerning public sector oil companies in India and Saudi Aramco. Indian side emphasised that there is huge potential to further develop the bilateral trade and investment relations especially in hydrocarbon sector. India invited Saudi companies including ARAMCO to participate and invest in crude oil storage facilities and down-stream industries in India. Saudi side acknowledged India’s importance as one of the fastest growing markets in the world and appreciated the changes and policies being initiated by the new government. Saudi side assured affirmative consideration of India’s growing demand for crude and LPG while also agreeing to look into the issues underlined by India concerning trade and investment in hydrocarbon sector between the two countries. Both the side found common areas of cooperation such as strategic reserves, petrochemical conservation, research and development, refineries and energy efficiency programmes. Indian side stated that India believes that the bilateral strategic partnership is important for not only our two countries, but also for the progress and stability in our region and beyond and highlighted the “Make in India” Campaign launched by the Prime Minister Narendra Modi in September 2014 offering investment opportunities in 25 key manufacturing sectors in India and the Government’s thrust on improving business environment in India for investors. Sh. 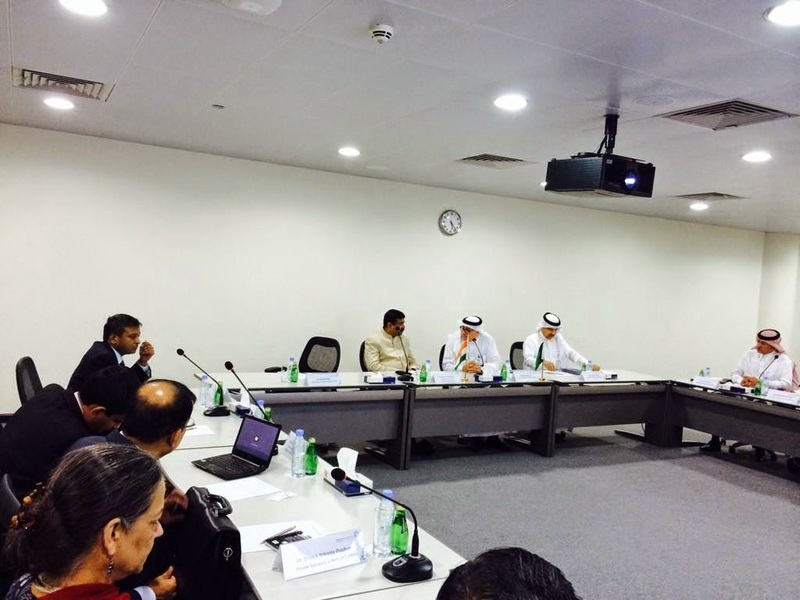 Dharmendra Pradhan and Indian delegation visited Saudi Arabian Basic Industries Corporation (SABIC) and King Abdullah City for Atomic and Renewable Energy (K.A.CARE) and held discussions on the issues of mutual interests. Indian side also made a presentation on REINVEST, India’s first Renewable Energy Global Investment Promotion Meet & Expo being held from 15-17 February, 2015 in New Delhi to showcase India's manufacturing capabilities and latest technologies in renewable energy sector. They also visited Saudi Aramco headquarters in Dhahran and had an interactive meeting with businessmen at Chamber of Commerce in Dammam before departing for New Delhi from Dammam Wednesday night. The India Saudi Energy Consultations is a very important mechanism for bilateral engagement as it provides an opportunity at the highest level to discuss issues of mutual concern in the most important sector of hydrocarbons. It also helps both the countries to discuss ways and means to take bilateral relationship from a buyer-seller stage to that of deeper engagement including investment in joint projects and technical cooperation as envisioned during the visit of His Royal Highness the Crown Prince to India earlier this year. The first round of energy consultations/dialogue was held in New Delhi in February 2012. Sh. Dharmendra Pradhan emphasised the need of having these consultations more frequently and invited His Royal Highness Prince Abdulaziz bin Salman with a delegation to visit India in the first quarter of the next year to take forward the fruitful discussion held during this second round of Saudi Arabia India Energy Consultations. India and Saudi Arabia enjoy cordial and friendly relations reflecting the centuries old economic and socio-cultural ties. In the recent times, the historic visit of the Custodian of Two Holy Mosques King Abdullah to India in 2006 imparted a fresh momentum to the bilateral relationship. The visit by Indian Prime Minister to Saudi Arabia in 2010 raised the level of bilateral engagement to ‘Strategic Partnership’ and captured the spirit of enhanced cooperation in political, economic, security and defence realms. In February 2014, His Royal Highness Crown Prince Salman Bin Abdulaziz Al-Saud, Deputy Prime Minister and Minister of Defence of the Kingdom of Saudi Arabia visited India. Saudi Arabia figures prominently in India’s energy security and is one of the major sources of its energy as India imports over 20% of its crude requirement from Saudi Arabia. India values Saudi Arabia as a reliable partner and an important pillar. Saudi Arabia is India’s largest supplier of LPG (Butane and Propane). Saudi Arabia today is 4th largest trade partner of India. There has been a steady growth in bilateral trade during 2013-14 (USD 48.75 billion). In the CFY 2014-15, the bilateral trade has already reached USD 20.27 billion (April – August 2014).